WILL OBAMA GO THRU WITH A TREASONOUS ACT LIKE GIVING BEGDAHL A PARDON? Sgt. Bowe Bergdah has asked President Obama to pardon him before leaving the White House. Will Obama provide such a pardon to a traitor? As reported at the NY Times, the request is a pre-emptive pardon that would avert Sergeant Bergdahl’s court-martial trial on charges of desertion and misbehavior before the enemy that endangered fellow soldiers. The trial is scheduled to begin on April 18. If found guilty, Bergdahl would probably face life in prison. As opined at the Gateway Pundit, “many of the men who served with Bowe Bergdahl have described him as a deserter but that didn’t stop Obama from trading multiple foreign Taliban terrorists for him a few years ago.” But who would really be surprised if Obama, the divider in chief did such a thing? One person who would not is President-elect Donald Trump. He was highly critical of Bergdahl on the campaign trail, calling him a “dirty, rotten traitor”. A source told Fox News that Bergdahl wrote a letter to Obama thanking him for rescuing him in 2014 and trading him for the Guantanamo Bay detainees. White House and Justice Department officials also told the New York Times that Bergdahl submitted several copies of a clemency application that were sent to the Pentagon, the Justice Department and the White House immediately after the election. The pardon would avert Bergdahl’s court-martial trial, which is slated to begin in April. He faces charges of desertion and misbehavior before the enemy, endangering fellow soldiers. 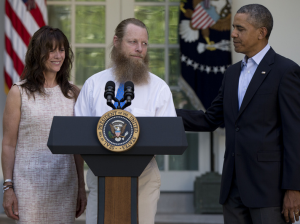 Remember when Sergeant Bergdahl was released in May 2014 and Obama appeared alongside his parents in the Rose Garden. The national security adviser, Susan E. Rice, said he had served with “honor and distinction.” Yet another thing Obama and his minions got 100% incorrect and on the wrong side of the American people. It will be a breath of fresh air to rid ourselves of the Obama administration once and for all. This is yet another reason why America voted from Trump in an electoral landslide, for actions like the current administration did with the likes of Bowe Bergdahl. America agreed with Donald Trump as to what should happen to the likes of this traitor. Take a look and listen below. It would appear that the U.S. military is taking the Sgt.Bowe Bergdahl very seriously and has ordered Bergdahl face a court-martial . 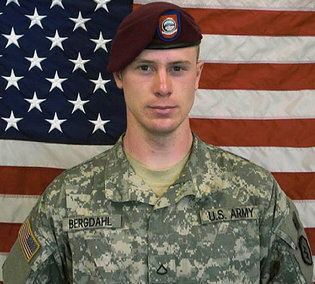 Bergdahl is charged with desertion and endangering troops. Pretty amazing, seeing that the Obama administration hailed Bergdahl with praises of honor and distinction when he was freed. Of course what would you expect from this ‘Alice in Wonderland’ president. In May 2014 Barack Obama swapped Sergeant Bergdahl for five Taliban detainees who were being held at Guantánamo Bay, Cuba. Brilliant. A top Army commander on Monday ordered that Sgt. Bowe Bergdahl face a court-martial on charges of desertion and endangering troops stemming from his decision to leave his outpost in 2009, a move that prompted a huge manhunt in the wilds of eastern Afghanistan and landed him in nearly five years of harsh Taliban captivity. According to Sergeant Bergdahl’s defense lawyers, the Army lawyer who presided over the preliminary hearing also recommended that he face neither jail time nor a punitive discharge and that he go before an intermediate tribunal known as a “special court-martial,” where the most severe penalty possible would be a year of confinement. Monday’s decision rejecting that recommendation means that Sergeant Bergdahl now faces a maximum five-year penalty if ultimately convicted by a military jury of desertion, as well as potential life imprisonment on the more serious charge of misbehavior before the enemy, which in this case means endangering the troops who were sent to search for him after he disappeared. 19 year old Mohammed Hamzah Khan, an American student has been arrested at Chicago’s O’Hare Airport in an attempt to travel to Syria to join the terrorist group ISIS. The Bolingbrook teen has been charged with attempting to provide material support to a foreign terrorist organization, specifically by attempting to join the Islamic State, ISIS. The charge of attempting to support terrorism carries a maximum penalty of 15 years in prison. An American teenager disgusted with the American way of life has been arrested at Chicago’s O’Hare International airport after he allegedly tried to travel to the Middle East to join and fight with ISIS. Federal prosecutors announced on Monday that FBI agents arrested 19-year-old Mohammed Hamzah Khan, of suburban Bolingbrook, on Saturday evening before he boarded a flight to Istanbul, Turkey, via Vienna. They accuse him of attempting to travel overseas to support terrorism which carries a maximum sentence of 15-years and Khan is also charged with attempting to provide material support to a foreign terrorist organization. On Monday, the slight, bearded Khan appeared in a federal court in orange jail clothes, calmly telling the federal magistrate that he understood the allegations. The local CBS affiliate in Chicago identified a Facebook account belonging to a Hamzah Khan as that of the would be ISIS recruit. CNN – Planned to meet contact in Istanbul. During questioning at the airport, Khan waived his Miranda rights and told FBI agents that a person he met online had given him the phone number of a person to call once he arrived in Istanbul. That person, Khan told agents, was to take him into ISIS territory. The Department of Justice said the $4,000 round-trip ticket to Istanbul was bought on September 26. But details on who purchased it for Khan and who he was to meet in Turkey were not disclosed. According to the complaint, Khan told authorities he was planning on working in some type of public service for ISIS — like a police force — providing humanitarian work or taking up a combat role. There comes a point and time when enough is enough. That point was just reached with the Obama presidency.Yesterday, State Department spokeswoman Marie Harf indicated, while answering media questions in the wake of the ill-advised Taliban prison swap for Sgt. Bergdahl, that she did not think that fellow soldiers were not a reliable source on Bergdahl’s walking away from his military unit. WHAT!!! Did she just call those soldiers who have spoken out against Bergdahl and called him a deserter, liars? Has the Obama administration no shame? State Department deputy spokeswoman Marie Harf engaged in a heated exchange Tuesday with a reporter over the circumstances surrounding Army Sergeant Bowe Bergdahl’s capture five years ago, saying she does not think his squad mates have the best idea of what happened when he disappeared. As if the economy and Obama’s handling of domestic issues was not bad enough over the past six years that has seen little to no recovery from the recession. Escalating federal debt out of control and a government takeover of the healthcare system that was never intended to provide care, but rather control. A foreign policy that has alienated our allies and emboldened our enemies. Scandals that has seen entities like the IRS purposely and willfully target Conservative organizations. Cover-ups in Benghazi where no one came to the aid of Americans in distress that left four Americans dead, including a US Ambassador. A VA scandal that this administration knew about and ran on in 2008, yet did nothing. Now the Obama administration swaps 5 Taliban GITMO detainees for some one who many believe was a deserter. Now they are calling fellow military soldiers liars. ENOUGH! Watch the VIDEO below from The Kelly File, of the shameful actions of the State Department spokesperson and Lt. Col. Ralph Peters reaction just lambasting her and the administration. FOX News reporter: Does the State Department consider Sgt. Bergdahl to be a deserter? State Department spokesperson Marie Harf: No, Lucas, what we said is we are going to learn the facts on what happened here. Harf: Lucas, some of them, there are conflicting reports out there about this. FOX News: The guys on national television last night, his squad-mates, platoon-mates were not correct? Harf: I’m saying we do not know the fact pattern yet. We don’t. Nobody knows exactly what happened that night. Harf: I don’t think that that’s the case. Former Secretary of State Hillary Clinton was heard to be whispering to herself, what difference does it make. When the Far Left attack each other … with the Truth. It’s not just me who is laughing that anyone on BSNBC would have the CO-JONES to ask anyone if what they did affects their journalist integrity, the Lonely Conservative is getting a good chuckle herself.